The photo has the 2.0 gram chain. This item will be hand made especially for you! Minimalist Blank Bar Tag 40 x 6 mm Pendant Necklace 925 Sterling Silver 16-18"
Make a statement with our gorgeous silver bar necklace. 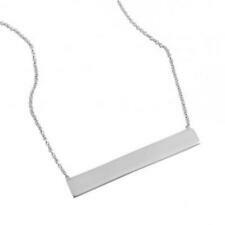 Dainty yet sturdy, this sterling silver bar necklace is luxurious. Have the bar engraved or leave blank. 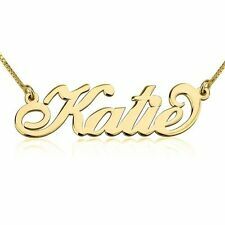 Our beautifully hand crafted nameplate necklace is truly a memorable gift. Please Note: We do not engrave at this time. Bar Necklace Details: Style: Engravable Name Bar Necklace Theme: Minimalist Bar Jewelry Engraved: No Metal: .925 Sterling Silver Bar Dimensions: 40 mm x 6 mm Bar Width: 1.5 mm Chain Length: 16 Inches w/ 2 Inch Extender Clasp: Spring Ring Total Weight: 2.85 Grams. The necklace is not gold filled, nor gold plated. This item will be hand made especially for you! Nadri Shiny Silver Tone CZ Pave Initial Letter A Necklace. Tiny and shiny! Sparkling CZ pave initial letter A pendant hangs from slender silver tone chain. Petite size. Very cute! Great with many outfits! 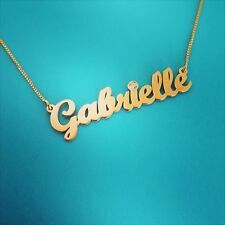 Disney Collectible / Name Necklace / Disney collection / Order Any Name! This luscious black velvet choker is a basic jewelry piece that is easy to style with any outfit. It will take a basic look to the next level. Makes an affordable perfect revival fashion gift. 1928 Jewelry. Crystal accents add sparkle to the elegant shine of the rose gold-tone chain. This is a fun way to brighten up your ensemble. An oval locket personalized by a cubic zirconia-sparked initial hides your chosen trinket at the base of a rondelle-accented chain. 16" length; 3" extender; 1/2"W x 5/8"L pendant. Lobster clasp closure. Gold tone mixed metal/cubic zirconia. Box comes without lid. These divisions are Guess?., which is probably the most well-known of the Guess divisions. The GbyGuess line is geared more towards teenagers and college students, although this is my favorite. Guess Kids is the newest division and was introduced last fall. Ring Size Main Color: gold. Hair Accessories. Main Stone. The necklace is not gold filled, nor gold plated. in Solid 14k gold. This item will be hand made especially for you! 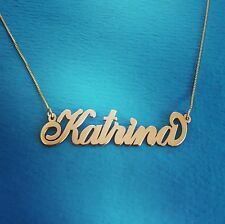 Name necklaces, personalized necklaces, 14 carat gold chain, Christmas Gift! The necklace is not gold filled, nor gold plated. Both bracelet bridal cable characters. 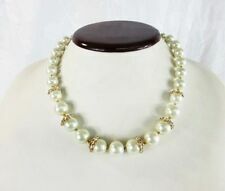 The necklace has an adjustable chain ranging from 16" to 19" in length, with a weight of between 8 - 10g. The thickness of the necklace is 1mm. Pendant height is 5-8mm and width is 30mm-70mm depending on number of letters.